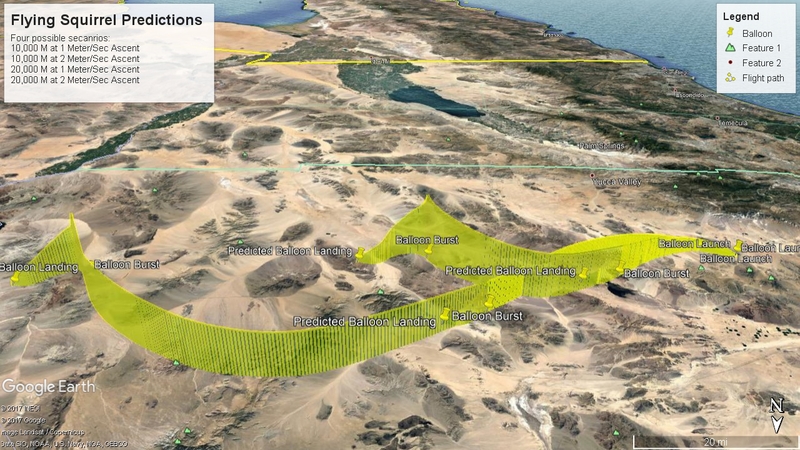 Home / Flying Squirrels / Launch updates – Launch on Jan 16th from Johnson Valley ,CA. Launch updates – Launch on Jan 16th from Johnson Valley ,CA. Winds and weather continue to be favorable for launch as scheduled on Jan 16th 18:00 UTC. 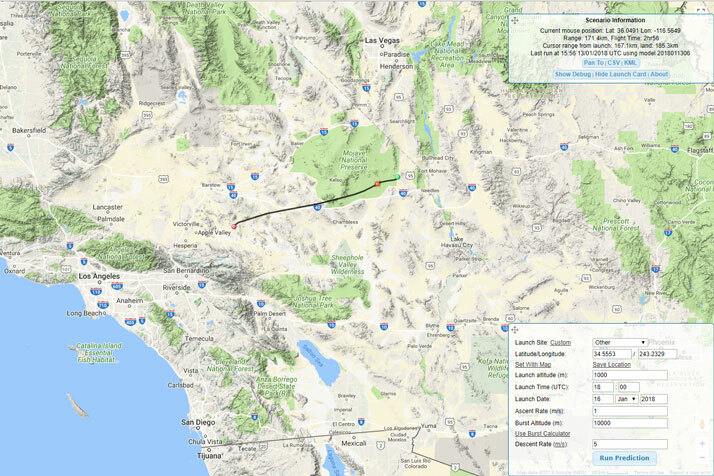 The launch of Flying Squirrel #1 is on schedule to occur on Tues Jan 16th 18:00 UTC (10AM PST) from Johnson Valley, CA. Weather predictions are looking good for launch day. If the weather holds as is and the predicted flight path is not Westerly, we are “Good for Launch” on schedule. Four possible flight predictions are below. First all four paths on a 3d Google Earth projection. Google Earth plot of the four predicted paths, looking from North to the South. The Salton Sea is at the top of the image. 10000 meter balloon burst, 1 meter per second ascent rate. 10000 meter balloon burst, 2 meter per second ascent rate. 20000 meter balloon burst, 1 meter per second ascent rate. 20000 meter balloon burst, 2 meter per second ascent rate.